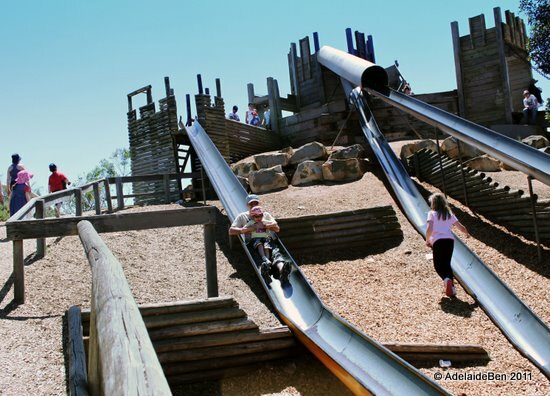 St Kilda Playground is one of the really fun playgrounds around Adelaide... I say AROUND as it's actually 30km due north of the city, out amongst the mangroves and tidal flats. Indeed, it's hardly the first place that you would go looking for a a great playground... and you might not be tempted to drive all the way out there even if you did. But if you've got young kids (and not so young kids) then it's worth the trip as there's so much to do... not least of all storming the castle!... with it's own draw-bridge, battlements, secret passages and of course escape chutes (a little known feature of castles, they later evolved into a sewage system). Oh - and did I mention that it's completely FREE! Free I tells ya! Now for an aside - I have to admit that I tend to get a little possessive of our DSLR. Even though it's only a baby DSLR, it's my baby DSLR (ok... I'll try and let go of it so that I can type better... there there boy, I'll pick you up again soon). Anyway, T-chan's not had that much exposure [pause for polite golf clap for bad pun] to the new camera. So as Daddy was helping L-kun out on the slides, it was up to T-chan to take some photos. Only thing was I had forgotten to change back the White Balance from a previous set of photos the night before. So the photo quality isn't that great, and PSE didn't help quite as much as I would have liked. It might be hard to pick from the photos, but the slides are reasonably long, and steep... and the ends kinda just stop (relying on the softness of the bark chips to soften your bottom bruising). Though we don't have the photos, L-kun was happily going down this slide all by himself. I was so proud (if a little freaked). The playground, as far as I can see, is completely self-supervised and does not have fencing. So, parents-be-warned... you will need to keep an eye on your children! One of L-kun's favourite things was to explore the underground tunnels under the castle's foundations. I mean, seriously, there were a series of large to small (and I mean small) concrete pipes that had been buried under the mountain of dirt. And you betcha, that meant getting VERY dirty. Why do kids love dirt soooo much? The good news is that parents can fit in there too (was that really good news?)... the bad news is that it gets quite claustrophobic and you will be covered from head to toe in dust. There is also a secret ladder that takes the kids right up the top to the battlements. 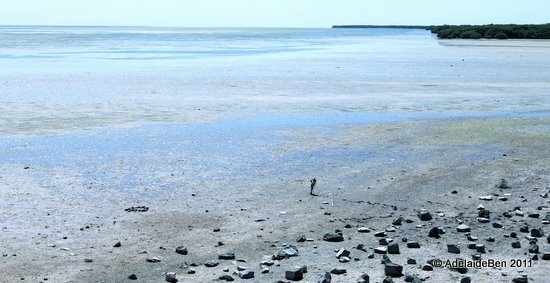 The St Kilda area is not really known for it's beautiful beach scenery, but rather it's mangrove swamps (which can also be visited). It's also known for it's pirates (don't all pirates have a secret hideout in a mangrove swamp somewhere). The pirate ship is yet another highlight of the playground.... and L-kun certainly loved it. Awwrrrrghhhh! Pieces of eight, and shiver me timbers! A pirate's life for me. ... Fire the cannons you scurvy dogs! The treasure will be ours for the taking... spare no quarter, or even a 3/8ths! Unfortunately, the pirate life is also tough one, and any number of small indiscretions (ie annoying Daddy or Mummy) could lead to a short incarceration in the ship's brig. Luckily he hadn't worked out yet that he can fit through the bars... whew! Actually - the whole behind bars thing seems to be a trend here... There's a number of different styles of activities in the playground, including a shaded younger-kids area in the form of a giant yell submarine. This is also a great spot to get some respite from the sun for the parents as well. There's also a tram museum out here that runs trams between the playground and the museum... a very odd place to put a tram museum if you ask me. The museum has been running the trams along the 2km track between the museum and playground since 1974 (admission $10 for adults, $7 for children over 4). It makes for a somewhat incongruous sight to see these old trams moving through the quiet salt-bush of St Kilda. It's sort of like a scene from an old-time movie... ok... maybe a Sergio Leone spaghetti western.Here he's practicing his steely gaze... he uses this often against the pesky varmits back home (that would be us, his parents). And yes, he does love spaghetti (or noodles as he often calls them). So I would definitely recommend taking the drive up north. 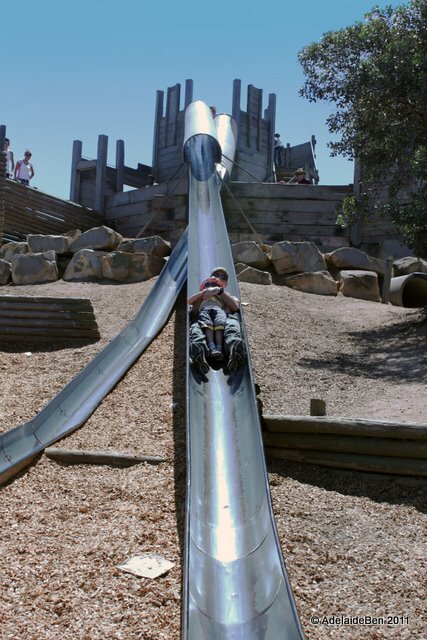 Note that on a hot day, it gets VERY HOT there, and people often bring cardboard to ride the slides (to avoid a case of the cooked-bottoms), and you have to be very careful to ensure your all sun-creamed up. There's also not much in the way of facilities other than a solitary icrecream van... so bring some food and drinks if you're staying the day. I also haven't showed the Big Children's slide yet... I'll keep that for another trip.